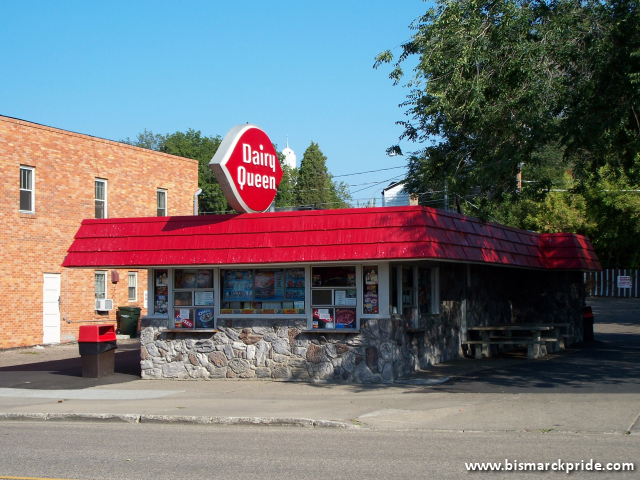 Bismarck’s first Dairy Queen, opened in 1949 on the edge of downtown. This Dairy Queen, open seasonally, is walk-up only and features no indoor seating. It is reportedly Bismarck’s oldest continuously operating restaurant. Much of its business comes from the nearby Elks Pool and Custer Park, both of which are practically across the street. Custer Park was Bismarck’s first municipal park, established in 1909; and Elks Pool was Bismarck’s first swimming pool, opened in 1932.